Length checks can be good and bad, in my opinion. They’re good because I get to see my progress and really assess what’s going on. They’re bad because I usually do them on straight hair and the process is LONG. As much as I care for my hair, I really don’t like spending too much time on it. flat iron my hair for the length check. (1) Pre-poo and detangling: Using 7 sections, I applied warm coconut oil on hair and scalp and applied Crème of Nature Intensive Conditioning Treatment. Covered with plastic cap and used my heating cap for 25 minutes. Left it to cool for about 10 min. Detangled with seamless comb. It has been ages since I’ve used coconut oil as my pre-poo oil. I wanted to prevent protein loss because of the heat I intended to use. (2) Shampoo and coffee rinse: I washed my hair twice using ORS Neutralizing Shampoo. For the past week, my hair was having issues retaining moisture and it felt ‘off’. Clarifying with this shampoo reset everything. I think I may increase the number of times I use a sulfate-based shampoo in order to prevent this feeling. After shampooing, I did a coffee rinse. I kept it on for 5 minutes before rinsing again. Towel dried for 10 minutes. (3) Protein treatment: I used Aphogee 2 min Reconstructor for 10 min with heat. I needed to fortify my hair before using direct heat. Rinsed and dried my hair with a t-shirt for 10 minutes. (4) Deep Conditioning and ACV rinse: I deep conditioned Hairveda Sitrinillah for 30 minutes with heat. Rinsed with cool water and did an ACV rinse. I allowed the vinegar to stay on my hair for ~2 minutes and did another cool water rinse. Dried with a t-shirt dry for 15 minutes. (5) Leave-ins and styling: I applied African Naturalistas leave-in conditioner and Carol’s Daughter Chocolät Smoothing blow dry cream. Detangled and distributed products with a seamless comb. I wanted to use a light moisturizing leave-in because I didn’t plan on putting any water-based moisturizer in my hair for a few days. My plan seemed to work because I haven’t applied moisturizer since I did this on Friday. My hair still feels moisturized, especially my relaxed ends. Roller set using water and dried my hair with a hooded dryer on medium heat for 1 hour. By this time it was late, so I slept with the rollers in my hair. The next day, I took down the rollers and trimmed some hair off each section. I aimed for about an inch on each section. I took off more in some sections, like my crown and the front. Next, I applied CHI silk infusion and wrapped my hair. I covered my hair with cling film and sat under the dryer with high heat for 15 min. After taking down the wrap, I proceeded flat iron my hair. My flat iron has temperature markings but it isn’t precise. I kept the temperature around 365 °F (185 °C). Flat ironing took FOREVER. While I was doing it, I trimmed more hair along the way. I would guess that I cut off a total of ~2 inches. My ends weren’t that great. After all of that, I threw on my length check shirt. It’s not fitting too well (#TeamChunk) so the lines don’t really match up anymore. If you compare my hair from January to date, I did retain some length. The longest part of my hair close to my bra strap! However, my hemline is see through 😥 The crown and the front of my hair are not as long as the back. Despite the major setback that I had, I was still able to retain something. My hair doesn’t look as full as it did in January. To maintain the style, I apply oil to my ends every other day. At night, I use flexi-rods. I don’t like how flat my hair looks so the flexi-rods give some volume and curls. I plan to keep my hair straight for at least a week. I’m pushing for 10 days. Unfortunately (or maybe fortunately), my new growth has already started reverting. I think I’m still having issues with my hair because of an internal problem. I may have mentioned that I have a bald spot at the top of my head. I’ve never had something like that before. It’s quite alarming. Don’t worry. I’ll do a post all about it. Plus, I’m having some issues with my skin. I’m planning to go to the doctor soon. By the time this post is out, I should have gone already. I’m happy for the length. I know it could be better, especially if I am able to improve my internal issues. 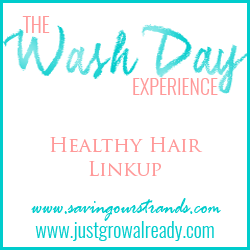 For more wash day posts, check out the Wash Day Experience. I’m hoping for a positive outcome. How did the trip to the doctor’s go? Your hair is looking super healthy, and you have gained length! Thanks, AB. The doctor was okay. He told me that I need to get better nutrients from my diet, drink more water, etc. He also mentioned that I need to find what is triggering my skin issues. He suspects it’s food or some sort of airborne allergen. I’m going back next week to see the dermatologist. Bald patch on crown? Hmm. I already suspect what is happening. Please, call us on 07061141501 in case you need to see a trichologist in our hair clinic. Thanks for the info, AN. I’m really loving the curly pics. Your hair looks healthy and shiny. So sorry about the bald patch. Are you stressed out? Do you think you’ll see a trichologist? Thanks, Sandra. I think the issues are coming from stress. I plan to see a trichologist next week. I will be sure to update everyone with the details. I love the curls too. Lovely! You are definitely making progress. I hope the trichologist can help with the issues you’re experiencing! Keep us posted! Thanks, Andrea. I’ll be sure to keep you posted. Keeping growing girl, that’s nice progress!